Choose from Black or Purple. Vaporisation provides the perfect means to permeate the atmosphere with delightful aromas. As the droplets of oil evaporate into the air our sensitive olfactory nerves transmit the scent to our brains. The effect on our minds and bodies can start within four seconds. By varying the oils and combinations, you will be able to change the atmosphere in your surroundings. You can choose when to relax or stimulate your senses and when to refresh and uplift the weariest of spirits. There are oils to sedate and help you sleep and oils to calm the over-active child or adult. Vaporisers assist breathing to help relieve the respiratory imbalances of asthma or croup. You can use an uplifting oil to aid concentration at home or at work. Even set the scene for a wonderfully intimate evening with your partner. Be sure to place your vaporiser on a heat proof surface! Fill the top of the burner with water. Add a few droplets of your chosen oils. A night light candle is lit underneath the dish. The heat from the candle gently evaporates the water and oils together into the surrounding air. The oils in the air provide an extremely antiseptic air freshener. ~Place your vaporiser on a heat proof surface. ~Burn your favourite essential oil or blend as often as makes you feel good. ~Burn magickal or Mystical oils to empower your intent and purpose. 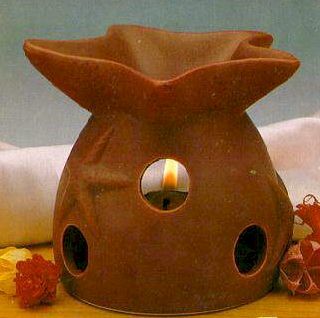 ~Burn fragrant oils or perhaps your favourite perfume if you wish. ~Keep out of reach of children. Enjoy aromatherapy as often as you find it to be beneficial. 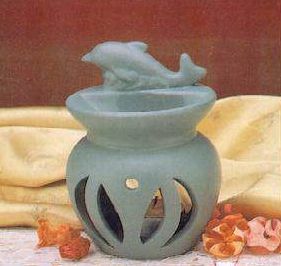 ~Never leave an oil burner unattended. ~Never allow the water to dry up while candle is still burning. This may damage your vaporiser. ~Use no more than 8-10 drops of oil to begin. ~Never place your vaporiser on polished or vanished surfaces - it gets HOT. Dinner Parties - three drops each of orange and clary sage oils plus two drops of peppermint oil. Very uplifting. Room Freshener - three drops of lemon grass and eucalyptus oil plus two drops of sage oil. All purpose blend. Meditations - five drops of myrrh, three drops of frankincense and two drops of pine oil. Peaceful and spiritual. Children's Partytime - five drops of orange and three drops of lavender oil. Fresh and cheerful. Mood Elevator - two drops of orange oil, four drops of clary sage and two drops of neroli oil. Raise thy spirits. Protection Blend - equal amount of Geranium, sandalwood and frankincense oil. Money Drawing - three drops of vetiver, two drops of patchouli oil. Lovers Blend - equal amounts of ylang ylang, lavender and geranium oil. Healing Blend - equal amount of sage, eucalyptus and pine oil. Sensuality Blend - equal amount of ylang ylang, lavender and orange oil. Love and Happiness Blend - equal amounts of ylang ylang, rose otto and sandalwood oil. Do you have a wonderful blend of your own that you would like to share with us? Please send to me and I will post it here for others to enjoy too.